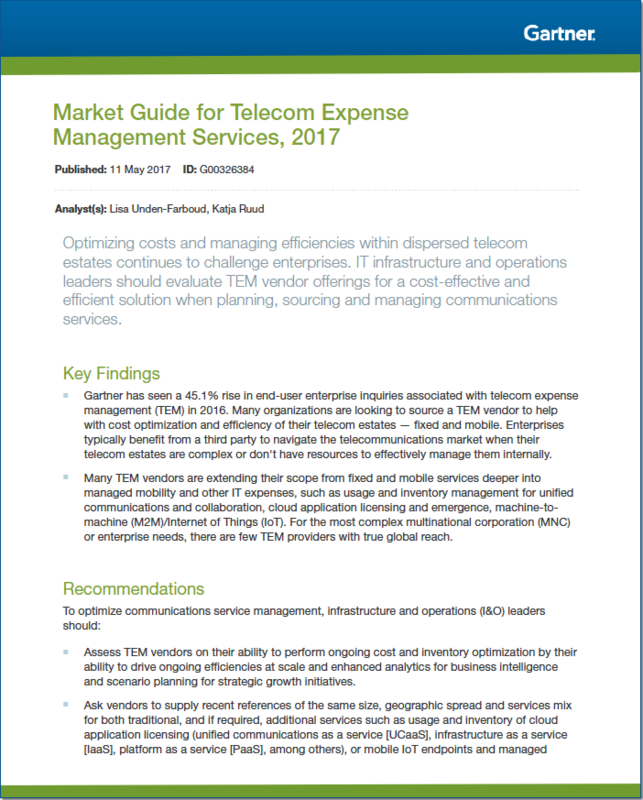 VoicePlus is the only Australian vendor to feature in the Gartner Market Guide: Telecom Expense Management Services, 2017. This Guide provides key research findings, recommendations, and an analysis of 15 leading TEMs vendors globally, including Australian company VoicePlus. Gartner has seen a 45.1% rise in end-user enterprise enquiries about TEMs in the past 12 months. Many TEMs providers are expanding their scope from Telecom Expense Management into Managed Mobility Services (MMS), Machine to Machine (M2M) and IT expenses. VoicePlus has already expanded into MMS with its Atrium Managed Mobility solution; and also provide M2M and MDM solutions. The Gartner 2017 TEMS Market Guide was published by Gartner UK-based analyst, Lisa Unden-Farboud and Sweden-based analyst, Katja Ruud, on 17 May 2017.